FedEx is making a big opportunistic bet on Europe. The U.S. shipper has agreed to buy ailing Dutch rival TNT Express for 4.4 billion euros ($4.8 billion) in a friendly, all-cash deal. That seems a full price for a troubled target – but cost savings, cheap debt and a strong dollar could help deliver good returns. The offer of 8 euros-a-share is a healthy 33 percent premium to TNT’s last close of 6 euros, and about 20 times the 40.2 cents of earnings per share analysts expect in 2016. That is far above FedEx’s median multiple of 15.3 times forward earnings over the last decade. The premium looks higher after considering TNT’s fading earnings power: EBITDA and EPS estimates for 2016 have fallen 22 percent and 27 percent in nine months, Datastream shows. Step back, though, and the FedEx move looks more sensible. It can probably run the business better. Also, the price is considerably lower than United Parcel Service’s 9.50 euros-a-share offer, which Brussels killed in 2013. With its arch-rival offside, and no subsequent bidders, FedEx presumably did not feel obliged to pay a knockout price. The dollar’s rally makes the deal even cheaper in FedEx’s home currency: 30 percent lower than the UPS bid, Berenberg analysts reckon. Any debt funding will be cheap too, since FedEx recently sold 50-year bonds with a 4.5 percent yield. FedEx is paying nearly 1.1 billion euros more than TNT’s pre-deal market value. To make the deal stack up, it does not need to match the 400 to 550 million euros in annual synergies UPS targeted. With less overlap, it probably can’t cut costs as much. But 150 million euros of pre-tax benefits, roughly a third of the UPS goal, with a tax rate of 25 percent, would do the trick, even if the gains are valued at a modest multiple of 10 times. Then consider the backdrop. Europe’s economy is perking up, which should in time benefit delivery firms. In turn the euro could recover too. If and when that day arrives, FedEx will have a stronger, leaner business worth considerably more in dollars. Talk about a special delivery. A postal worker of Dutch TNT delivers mails in Haarlem. FedEx agreed to buy TNT Express of the Netherlands for 8 euros a share in cash, or 4.4 billion euros in total, the delivery companies said on April 7. That represents a 33 percent premium to TNT’s last closing share price. The takeover has been recommended by both TNT’s executive and supervisory boards. 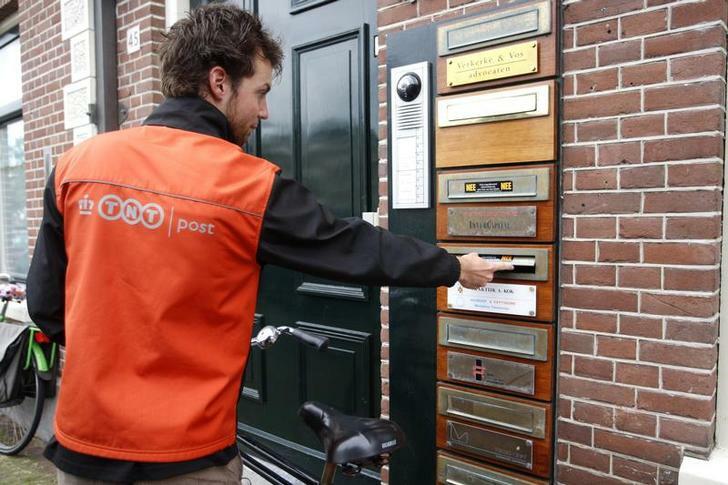 Sister company PostNL has irrevocably committed to tender its 14.7 percent shareholding. The deal comes two years after European regulators forced FedEx’s bigger rival, United Parcel Service, to abandon a 9.50 euro a share bid for TNT. However, TNT Chairman Antony Burgmans told a media conference the new deal was “much simpler” and “we are as certain as can be in life that this deal will close in Brussels,” according to Reuters. Shares in TNT rose 30 percent by 0950 GMT on April 7 to 7.818 euros a share.